Strategically built in the Don Valley on what was once a large estate with horses and hunting dogs, gardens and pathways, fountains and rivers running over the property, the once sprawling mansion and grounds is now just the mansion and gardens. This fantastic wedding venue in Toronto has a history and architecture that lends beautifully to taking pictures and here are some ideas of what to do when your are having your wedding photos at the venue that is one of the best in Canada. 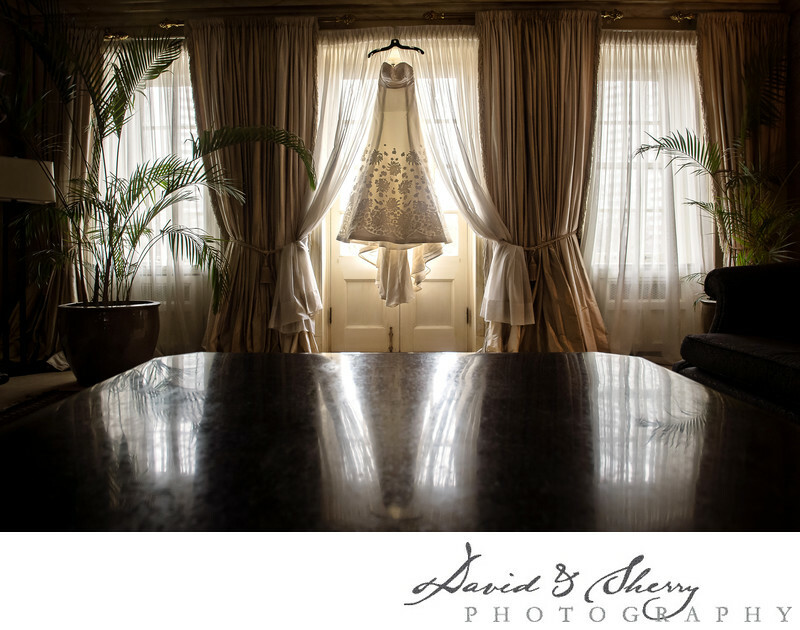 In this idea for a wedding we hung the dress in the window facing north in the upstairs area above the grand staircase, and we moved the large and comfortable couch out of the way and the large coffee table into place so we could use it as a reflection on the dress backlit and hanging in the window. We had to tilt the table slightly forward so the reflection was just right and didn't cut off the bottom of the dress. I love how it turned out. I would recommend having a look through our wedding portfolio for more ideas for your wedding decor, moments and details at Graydon Hall Manor.